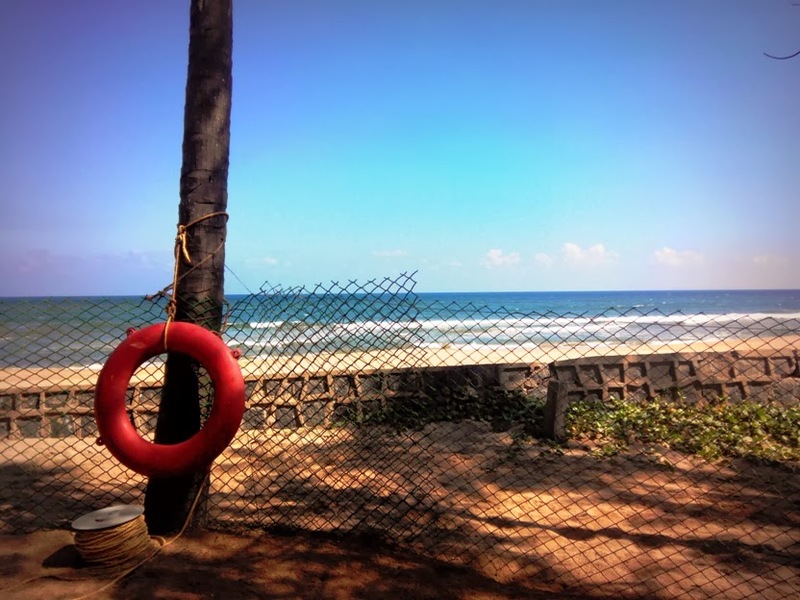 After a leisurely stroll around Dakshin Chitra, we arrived at Radisson Temple Bay, Mahabalipuram and decided to dine at The Wharf, facing the ocean [only because the other 2 restaurants had only buffet and we dint think we could do justice to that] . 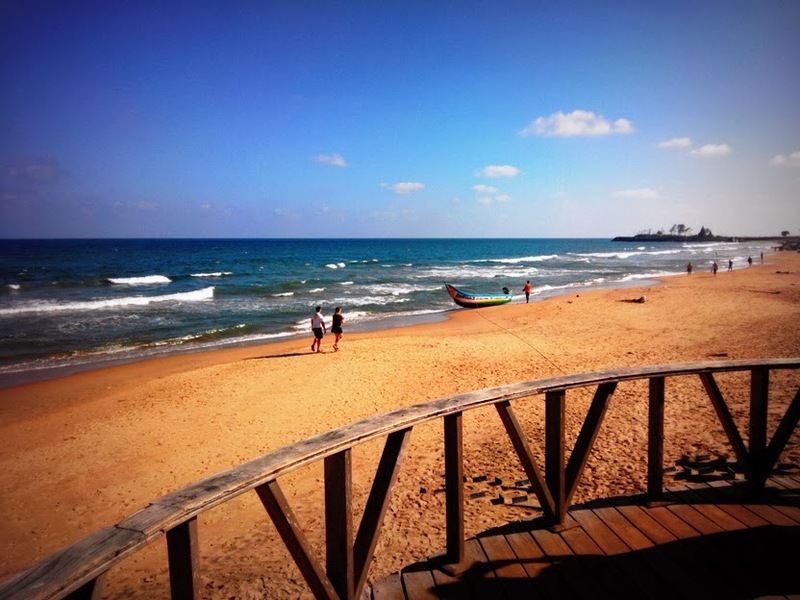 Our table was just a few yards from the ocean, we could hear the waves and feel the breeze. Only thing left was to run to the water and have some fun!! The blue waters were chill and just perfect. We spent about half an hour soaking, laughing, taking pictures and having a great time when it dawned on us that we would have to leave, bid it all adieu!! But, we were not ready to say Bye yet! We went ahead, washed ourselves, dusted off as much sand as possible and sat near on the stone wall for a while, enjoying the silence and beauty of the place. About a week ago, sometime during the day a friend messaged asking if I would like to come with her and her boyfriend to a temple near Gingee. I said "sure why not. Is anyone else coming?" She replied saying one of her other friends was also coming along. Glad that I was not going to be a 3rd wheel I confirmed my presence. Saturday evening we met for a show, and subsequently did dinner as well. That is when she told me they had booked a cab that would come to my place around 6 am, she & her boyfriend would land there by then. I was up and ready by 5.45, he came around 5.50, the cab came at 6 and she reached within minutes. We were off and on the road when she mentioned her other friend wasn't coming as her son was unwell.. [mental voice- oh no, dreaded 3rd wheel situation, hopefully not very awkward] We stopped for breakfast at the Motel Highway Inn, had hot idli, dosa and coffee and were on the road within an hour. We reached the temple around 9, looked around making sure there wasn't too much of a crowd [ am kinda allergic to crowds]. The temple gopuram was a bright yellow and there were women and men dressed in various shades of yellow and red. We were at the Angala amman temple in Mel Malayanur. 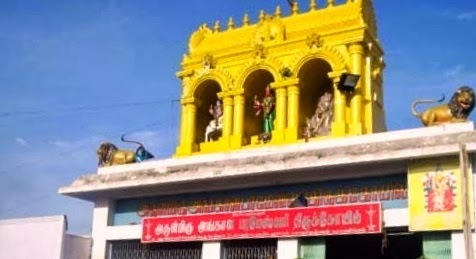 The Angala Parameswari Temple [another name for the same temple] is located at Mel malayanur, about 32 km from Gingee in Viluppuram District. The main deity worshipped in this temple is the "Sembadavars". As we entered the temple sanctum, the 1st section housed an ancient snake pit. You go around it to see the main Deity. This Goddess is known to be very powerful, anything you wish for you get! While we headed out of the main sanctum doing pradakshanam, I noticed a ritual of sorts going on in the outer ring. There was a man who looked like a priest throwing vermilion at a girl's face and saying something which she repeated. I was told people come here when they are possessed to chase away demons and so on. And the temple is crowded to the brim on new moon day, cos that is a day when such incidents are way too many. I dont really believe in these, but it was interesting to witness the process. And with that we were out and back to Chennai [we had a blast through the drive and nope, I did not even for a second feel like the 3rd wheel]. Well, I did pray for all and here's hoping the year ahead is great! It was my friend's birthday and I had decided to lane there as a surprise. Her husband knew of my plans, but she did not. That eventful morning I landed in Kochi, it was pouring. I reached the entry gate and waited for my friend's husband to come pick me up [ navy area, so he had to come with a pass to allow me entry]. There I stood nearly drenched with my bags as he pulled in near the small passage. Hopped into the car and got a quick update that my friend was fairly mad and pissed off with him. Why? 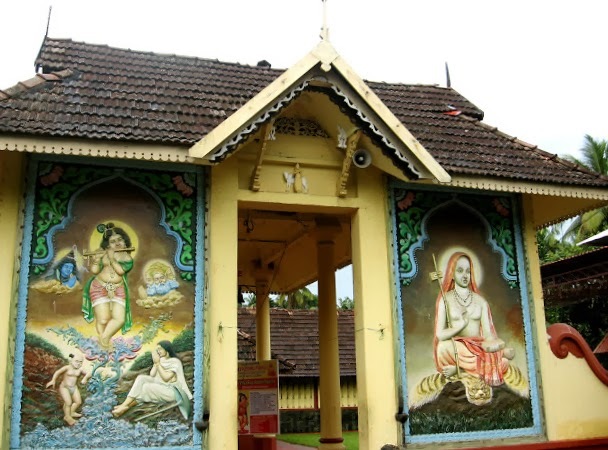 She had wanted to visit Kalady temple that morning but he kept putting it off saying he shall take them that afternoon. She had huffed off to the shower while he left for "work" aka to pick me up. I got home, was greeted by their kids who upon seeing me began screeching with excitement. Took all my might to get them calmed down. The little one was unable to zip her lips, she went running screaming "ma, look who's here, look who has come.. come out fast...".. hahaha... It was nearly half an hour before my friend stepped out of the room, all dressed up and muttering under her breath about how her husband couldn't fulfil her wish even on this special day. She turned into the living room, saw me and stood still zapped. Phew! !What a memorable moment that was.. :-) Once she was convinced I was really there, she couldnt stop screeching, told everyone who called about my surprise visit and then we got to making a quick lunch. Around 2pm, we were all piled into the car and on our way to Kalady, a place I had been wanting to visit forever but yet to. My grandparents, mom dad, uncle etc had all visited the place. And finally, it was happening. Kalady incidentally is just about 6kms from Nedumbassery Airport and the nearest station is 10kms away-Angamali railway station. Infact, we had to cross the airport and go down the road to reach Kalady. It was a fairly small village town that was nearly silent when wee reached there. We pulled into the parking lot near the temple and made our way to the temple. I noticed there were 2 temple complexes, one straight ahead and other on the right side. Friend told me the way to the river was between the two. Apparently there were steps leading to the river from the temple, but it had been sealed shut few years ago. We had to cross a small bridge of sorts to get into the temple, in the pond below were quite a few fish and turtles that had the kids excited. 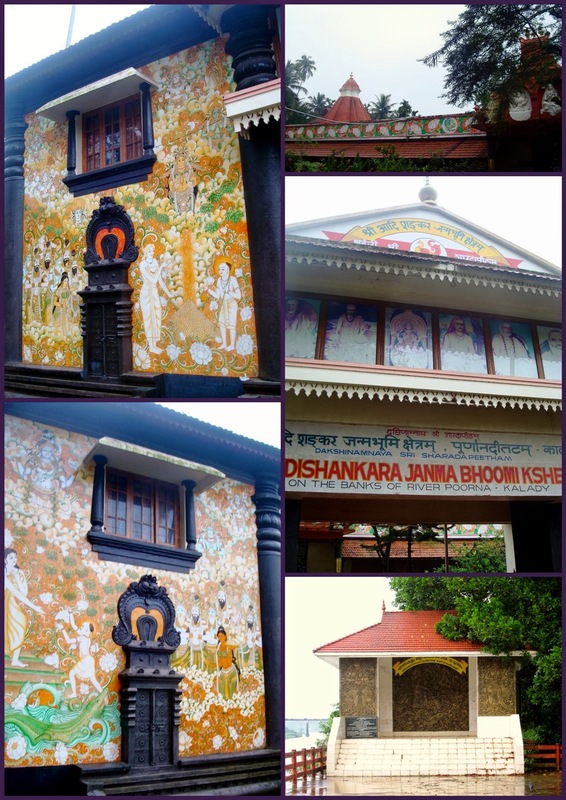 There was one shrine dedicated to Adi Shankaracharya as Dakshinamoorthi and the other is dedicated to Goddess Sharada. the temple is maintained by the Sringeri Mutt. On the left hand side, near the temple entrance is a black pole, which is said to be the exact place where Adi Sankaracharya was born. There is also another spot called "Brindavan", where Shankaracharya's mother Aryamba was cremated. There is a light that burns day and night here in the lamp within the box. 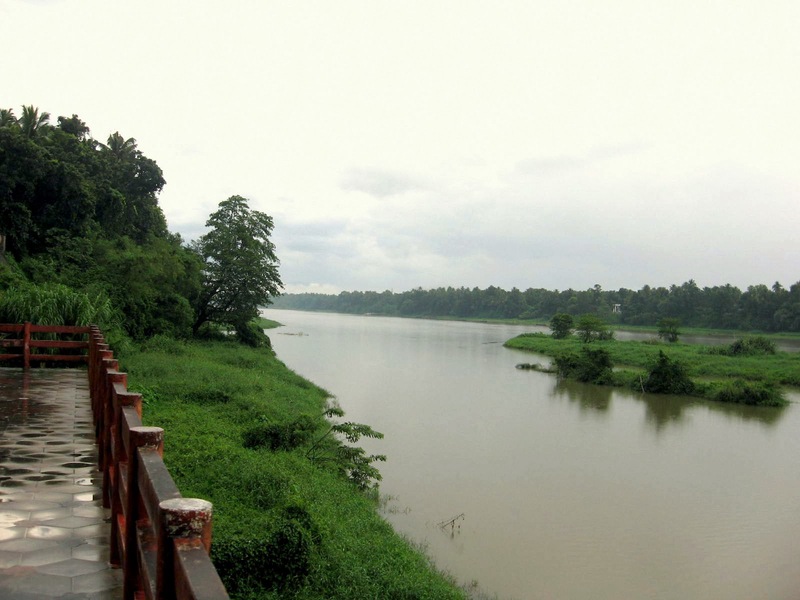 The river here is referred to the "Crocodile Ghat". This is the place where the young Shankaracharya once got caught by a crocodile. Legend has it that his mother was dead against his taking Sanyasa and so went into the river and refusedd to come out till she agreed. This is when a crocodile got hold of him and would not let go. Once the mother gave him permission to take up Sanyas, the crocodile let go of his leg. There is also a large hall in the temple where homams and small functions are held where the ceiling is lined with the entire story of Adi shankaracharya in image format. The paint was wearing off, letters fading away, we wished someone would maintain this better. As you walk to land from the river, on the left you will see the Shri Krishna temple, the family temple. Built in true Kerala style, this temple was beautiful. But because of the rains, we beat a hasty retreat to the car, had a quick hot cup of tea and headed back on the road towards Kochi. Legend holds that one day, the widowed mother of Little Sankara, Aryamba, fainted after walking three kilometers for her daily bath in the Periyar then known as Purna river. Feeling helpless, Little Sankara prayed to Lord Krishna. The tears of the child moved Krishna, who blessed him thus: "the river will flow where your little feet marks (കാലടി വരയുന്നിട്ത്തു നദി ഗതി ആവും). The Purna river took its new course in the place marked by the little boy's feet. 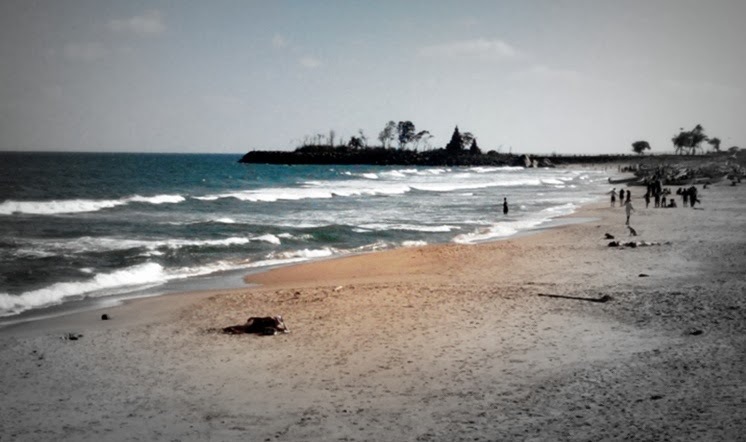 That place came to be called Kalady. The Purna river began flowing through Little Sankara's home garden. Sankara then installed Lord Krishna into the present temple, and marked the occasion by reciting his famous Ätchutha Ashtakam. Thus 'Kalady' signifies the love of an innocent child for his beloved mother and the blessings of Lord Krishna. It would be an understatement if I said this year was off to a not so great start. It has been an amazing one so far. 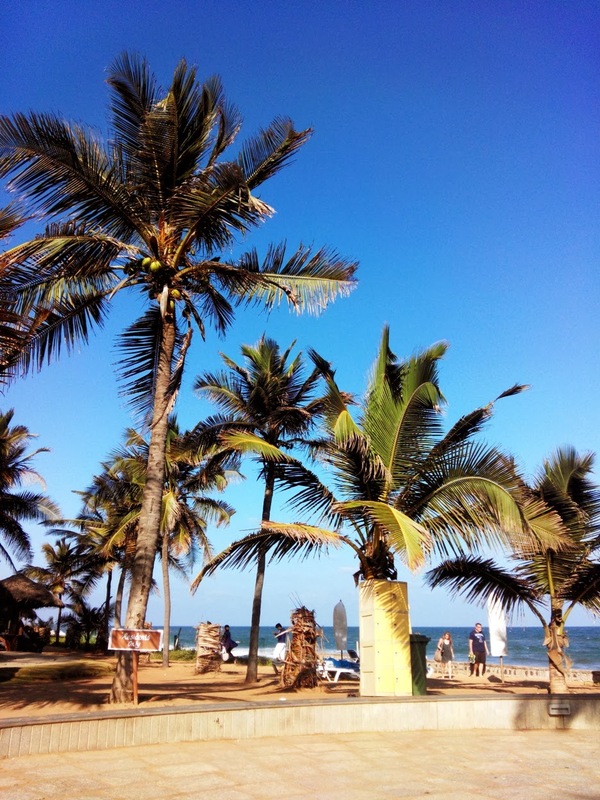 And the 1st trip was to a town I quite love, Pondicherry. Saturday night a friend messaged asking for info on Pondicherry- things to see, where to stay etc and thus formed a plan in my head. I quickly messaged another friend who has been wanting to visit Pondicherry before she moved out of Chennai and asked if she was upto it. She replied "yes, lets go, ask others too". I asked few others but none could come since it was a weekday trip and they all had commitments. So, Sunday evening I booked us tickets on the bus and rooms in a hotel in Pondicherry. Monday morning both of us were on the bus on our way to Pondicherry... Yayy!! We reached around 9.30, checked in, grabbed a bite to eat at La Cafe on the beach and wandered up and down while waiting for our other friends to arrive. 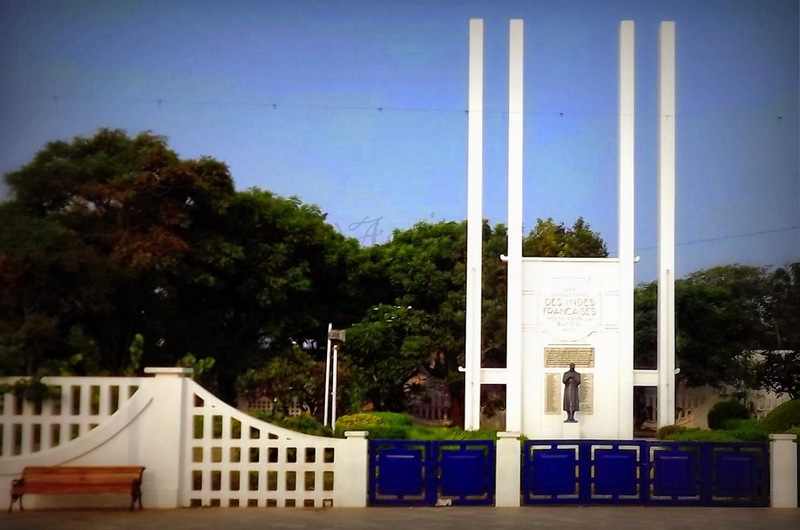 And that is where I clicked a shot of the French War Memorial. 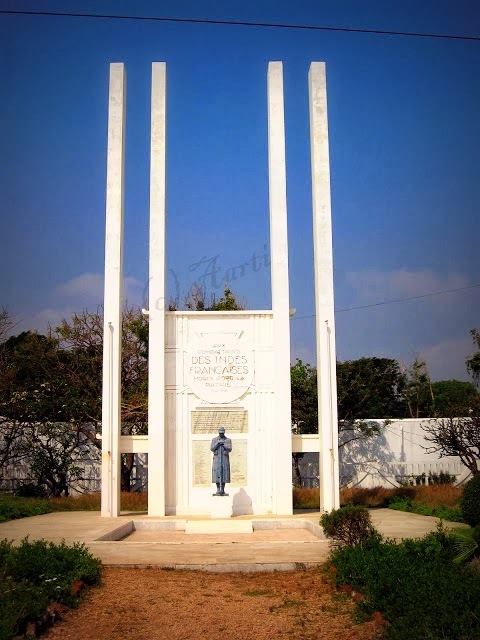 It is located on Goubert Avenue [beach road] and is a monument erected in memory of all the soldiers who lost their lives in the First World War. Every year on 14th july an annual commemoration is celebrated when the monument is lit up. We spent a few minutes there and moved down the road where I pointed out the Joan of Arc and other monuments along the road. I had been fascinated by the Step wells since I laid eyes on the very 1st one, in Karnata- Hulikere. Since then, I have been reading about these wells, the architecture and trying to visit one in the destination I hit. I spotted one in Hampi- the Pushkarni, inside the Royal Enclosures. 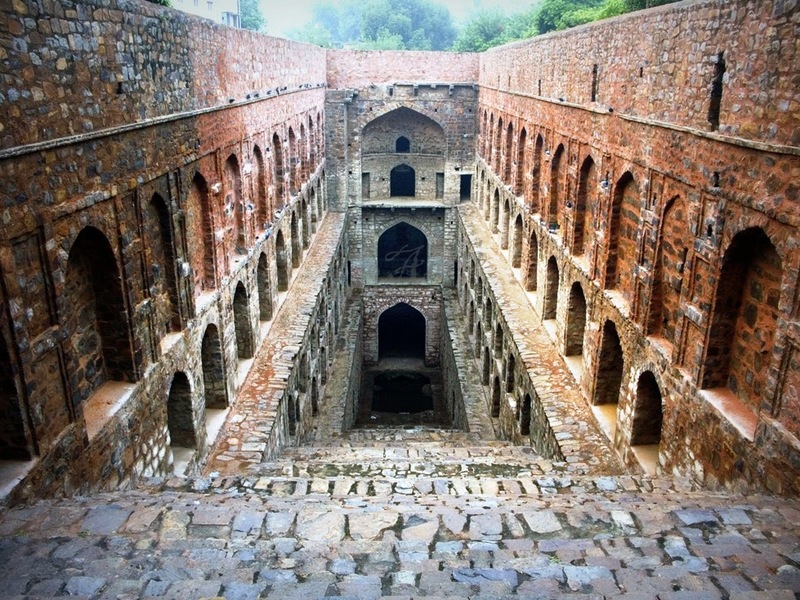 And then, last December when i was in Delhi, I managed to convince mom and uncle to come with me as i went searching for the Agarsen or Ugrasen Ki Baoli near Connaught Place, a short walk from Jantar Mantar. We drove around a bit, and finally located Hailey Road where the Baoli was situated. Parked the car few streets away and began walking down. I was excited, mom was just tagging along and uncle was curious to see what this hidden treasure in his city was. On our left, the wall had a huge vibrant Ganesha mural, that led to a demon face, an angel or devil and a cross on rosary beads.... fascinating!! A few steps up and we spotted the traditional ASI board that said Agrasen ki Baoli or Ugrasen ki Baoli is a 60-meter long and 15-meter wide historical step well. Even though there are no records of who actually built this well, legend has it that it was King Agrasen who must have built this well during the Mahabharatha epic era. It was repaied and rebuilt in the 14th century by the Agarwal community which once again traces its origin to Maharaja Agrasen. The first thing I noticed was a dilapidated tomb of sorts on the right side, there were a bunch of chairs piled up and a dog sleeping. And then as I turned left, I was left speechless.. It is one among the many in Delhi. During rainy season or the monsoons, nearly all the 103 steps are submerged in water. Since it was winter, we were able to see far below. There are three levels, and each level is lined with arched niches on both the sides. The stone walls of the well are stark yet beautiful, forming a 60 x 15 meter rectangle structures.. The bricks are all in good shape, just that the place is now inhabited by pigeons. Situated in the midst of towering concrete structures, it sure was a visual treat. I dreamt of how the place must be filled with water and how the Kings & Queens used it back in the days. Hoping to visit the others during my subsequent trips to Delhi.